In the wake of Attorney General William Barr's brief teaser on the Mueller report, and his independent conclusion that the Trump Campaign had not "conspired or coordinated with the Russian government in its election interference activities," the President and Republicans are seizing the opportunity to attack. On Thursday, the nine GOP members of the House Intelligence Committee called for the resignation of Committee Chair Adam Schiff (D-CA). The statement, read by Congressman Mike Conaway (R-TX), accused Schiff of being "at the center of a well-orchestrated media campaign claiming, among other things, that the Trump campaign colluded with the Russian government." 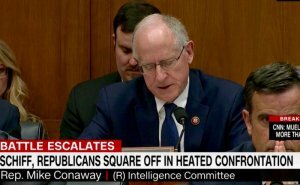 Conaway read a litany of accusations, including leaking information and Schiff's purported "willingness to continue to promote a demonstrably false narrative." He concluded with saying Schiff's actions, "past and present .. are incompatible with your duties as chairman of this committee and ... as such, we have no faith in your ability to discharge your duties in a manner consistent with your constitutional responsibility and urge your immediate resignation as chairman of this committee." The move was a symbolic one as Democrats, following the 2018 midterm electons, have majority control of the US House, the committee chairpersonships, and, hence, the votes. It was, nevertheless, a public attempt to try to discredit Schiff, who is among Trump's chief rivals in investigating the president's actions. 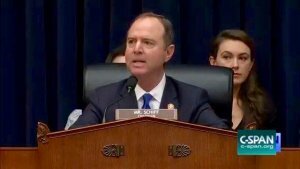 Schiff's fiery response was swift and direct. "My colleagues might think it's OK that the Russians offered dirt on the Democratic candidate for president as part of what's described as the Russian government's effort to help the Trump campaign. "My colleagues might think it's OK that when that was offered to the son of the president, who had a pivotal role in the campaign, that the son did not call the FBI, he did not adamantly refuse that foreign help - no, instead that son said that he would 'love' the help with the Russians. You might think it was OK that he took that meeting. You might think it's OK that Paul Manafort, the campaign chair, someone with great experience in running campaigns, also took that meeting. You might think it's OK that the president's son-in-law also took that meeting. You might think it's OK that they concealed it from the public. You might think it's OK that their only disappointment after that meeting was that the dirt they received on Hillary Clinton wasn't better. You might think that's OK.
You might think it's OK, that, when it was discovered a year later, that they lied about that meeting, and said it was about adoptions. You might think it's OK that the president is reported to have helped dictate that lie. You might think that's OK. I don't. You might think it's OK that the campaign chairman of a presidential campaign would offer information about that campaign to a Russian oligarch in exchange for money or debt forgiveness. You might think it's OK. I don't. The House Intelligence Committee's investigation, and that of six other congressional investigations, is separate from the Special Counsel's investigation and that of the US Attorney's office for the Southern District of New York, which is probing the Trump Organization and the Trump Inaugural Committee. You might think it's OK that that campaign chairman offered polling data, campaign polling data to someone linked to Russian intelligence. I don't think that's OK.
You might think that it's OK that the president himself called on Russia to hack his opponent's emails, if they were listening. You might think it's OK that later that day, in fact, the Russians attempted to hack a server affiliated with that campaign. I don't think that's OK.
"You might think it's OK that the president's son-in-law sought to establish a secret back channel of communication with the Russians through a Russian diplomatic facility. I don't think that's OK.
You might think it's OK that an associate of the president made direct contact with the GRU through Guccifer 2.0 and WikiLeaks and (what) is considered a hostile intelligence agency. You might think it's OK that a senior campaign official was instructed to reach that associate and find out what that hostile intelligence agency had to say, in terms of dirt on his opponent. You might think it's OK that the national security adviser-designate secretly conferred with a Russian ambassador about undermining U.S. sanctions, and you might think it's OK he lied about it to the FBI. You might say that's all OK, that that's just what you need to do to win. But I don't think it's OK. I think it's immoral, I think it's unethical, I think it's unpatriotic and, yes, I think it's corrupt, and evidence of collusion." ... I do not think that conduct, criminal or not, is OK. And the day we do think that's OK, is the day we will look back and say that is the day America lost its way." 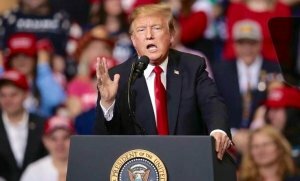 Before a raucous crowd in Michigan last night, Trump falsely claimed that he had been exonerated, despite the fact that the full 400-page Mueller report has not been released. A redacted version is now expected by mid-April. The President berated "little pencil-neck Adam Schiff," adding, "He has the smallest, thinnest neck I have ever seen. He is not a long ball hitter." America may have already lost its way.